Four Mile Run Conservatory Foundation: Wild Water Weed Weekender? From a yellow kayak, I am informally surveying the weed beds of the Potomac near the mouth of Four Mile Run in Alexandria. Juvenile fish dart near the surface, and all around me flit bright blue damselflies, and a few reddish dragonflies, alighting on the floating vegetation and tiny yellow flowers. I am here this sunny morning to get a close look at what’s growing below the water surface, having noticed abundant aquatic plant growth this summer. Whether from Old Town, the airport, or DC, you’ll easily spot the green swaths of growth on the river. And it isn’t algae you’re seeing. Back in July at the Washington Sailing Marina, I noticed the green vegetation extending well out into the Potomac and throughout the lagoon where colorful sails cross back and forth and aspiring skippers learn to harness the wind. A sailing camp instructor lamented how this summer the lagoon was choked with hydrilla – Hydrilla verticillata, an exotic invasive aquatic plant, infamous for fouling boat propellers and gear. It’s probably no fun to be entangled in it when learning to windsurf, either. Hydrilla is one among many species of submerged aquatic vegetation (SAV) found in the Potomac and the Chesapeake Bay. 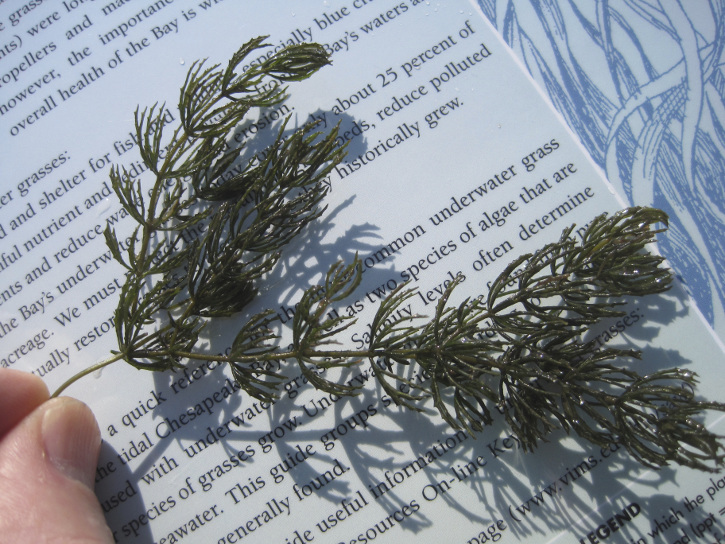 In the mid-1990’s, I remember hydrilla made the local news for its abundant growth, and at the time, there was concern that it would crowd out native SAV that support the aquatic ecosystem. SAV provides nursery areas for young fish and habitat and food for fish, fowl, and invertebrates, and it improves water quality and clarity by trapping nutrients and sediment. The District of Columbia sometimes employs a mechanical aquatic weed harvester to remove hydrilla and keep navigation channels weed-free. But last weekend, when I kayaked for the first time since early in the summer, I could see that the SAV beds around the marina and Daingerfield Island didn’t look like hydrilla. And whatever the plants were, I could see they harbored numerous fish, insects, and feeding birds. Among the usual characters—ducks, geese, and cormorants—I also spotted a shy green heron along the shoreline, and American bitterns, with their long striped necks, wading in the SAV beds. There was some hydrilla, but not in abundance. Today I am back with a field guide to Chesapeake Bay SAV, taking time to identify what’s here. The small yellow flowers belong to water stargrass (Heteranthera dubia), and together with coontail (Ceratophyllum demersum), these native SAV species easily account for 90 percent of what I see, and hydrilla is interwoven here and there. The growth is thick, and paddling through it demands a modified technique to keep the paddle from getting stuck. The water is clear, and I can see the plant forms rising from well below the surface. Tiny fish flee as the kayak approaches, and—splash!—a large one rolls suddenly at my wrist as I draw the paddle, startling me nearly to overturning in the otherwise calm water. As I continue to hunt around, I find wild celery (Vallisneria americana), a personal favorite. A few years ago our family participated in a Chesapeake Bay Foundation program to grow wild celery at home and plant the seedlings in a restoration area downriver near Mason Neck State Park. And here it is, flourishing on its own, just off Daingerfield Island below Four Mile Run. So what’s up with the SAV growth this year? I turned to an expert for a better understanding. Daniel Ryan is the Fisheries Research Branch Chief at the DC Department of Energy and Environment. He told me that within the District, which includes the water of the Potomac River all the way to the Virginia shoreline, the largest SAV bed historically has been the big grass flat north of the Wilson Bridge, but he remarked that, "the large flat below the airport is doing better than I've ever seen, and it is now connected with the mid-river SAV bed off Bolling Air Force Base. I don't recall those ever being connected before." Ryan characterizes SAV bed growth as,"extremely fickle, changing dramatically from year to year." Though he emphasizes that SAV restoration is helpful, he explains that there is a very strong relationship between SAV growth and springtime water flows. Although there was plenty of rain locally last spring, we didn’t see high volumes of water pushing from the Upper Potomac, so SAV was able to start growing earlier. By contrast, in a really rainy year like 2003, the heavy river flows wipe out the existing SAV beds and delay the start for SAV growth. The Fisheries Research Branch started mapping the District's SAV beds in 2002, when overall coverage was around 700 acres. SAV coverage has fluctuated widely since then, from essentially none in 2003-2004 and 2012, to nearly 600 acres in 2015. "I would think we're going to be close to 1,000 acres this year," Ryan says. There’s still time to take out a kayak and explore the marvelous SAV beds yourself, and commune with the abundant wildlife it supports, right at the mouth of Four Mile Run. You can rent kayaks or other small watercraft hourly from the Washington Sailing Marina through mid-October. Happy paddling! Some solid research you did there. Despite visiting many places with small rivers, I never noticed any kind of vegetation growth like this before. I wonder why that is.